There have been lots of highs and not too many lows in the Bangers & Mash kitchen in recent weeks. I’ll get the lows out of the way first. The first was a dish that really should have been too easy to mess up: a simple Swiss chard and potato tortilla. Then I went and left it in the oven just a tad too long and the egg turned to dry rubber. Not nice. But lesson learned for next time. More disappointing though was the fact I messed up my husband’s birthday cake. He requested a boston creme pie from Nigella’s How to be a Domestic Goddess. I’ve had a few baking successes recently and so perhaps I got a little cocky and over-ambitious. Boston creme pie – but where did all the filling go?! Well, the cake and ganache were delicious, but the creme anglaise filling was an absolute disaster. I should have known it wasn’t thick enough but I was in a rush and used it anyway. So when I put the second tier on top, it all slowly spilled out to leave a dry cake. Ah well, another lesson learned. But let’s forget about those blips and move on to the highlights. First on the list is a lovely springtime dish using ingredients foraged from the local hedges – wild garlic risotto. This was so good I’m making it again this weekend when my Dad and Step-Mum come to stay. Wild and free – wild garlic risotto! Who doesn’t love a good Sunday roast? Especially when it’s delicious free range pork with proper salty crackling, lashings of apple sauce and a cheesy leek bake on the side. This is what I made for my husband’s birthday meal on Easter Sunday. So although I ruined the pudding, he couldn’t complain too much because the main course had been so tasty! Sometimes it’s the most basic meals that turn out be the tastiest. One Monday evening I cooked us all a super speedy supper of stir-fried spring greens with noodles. Something seemingly worthy and virtuous was also exceptionally appetising, thanks to lots of ginger, garlic, Chinese rice wine, black vinegar and soy sauce. Tarragon is fast becoming one of my favourite herbs. I really like it in chicken dishes, such as the scrummy chicken pasta I made when my good friend Sarah came over during the Easter holidays with her kids. It’s an easy meal which also includes leeks, purple sprouting broccoli and cream cheese. When a recipe featuring black pudding appeared on my Twitter timeline recently I just had to try it. It was a pork, apple and black pudding pie and the perfect way to use up the leftover roast pork from Sunday lunch. Black pudding is a real guilty pleasure for me. Maybe it’s down to my Dad’s side of the family coming from Lancashire. Anyway the pie was absolutely delicious served with onion gravy and wild garlic mashed potato. Finally to the spicy lamb meatballs. 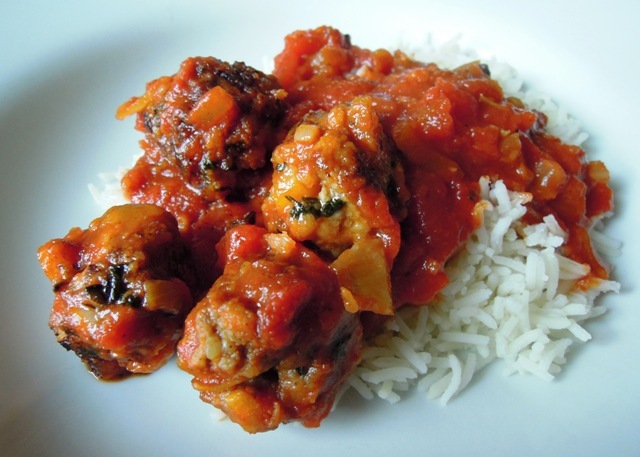 My family adores meatballs but I’ve only ever made them with beef or pork mince. I’ll definitely make this lamb version again, complemented so well by the spices, apricot and fresh mint. Next time I might serve them in warmed pitta bread with salad and tzatsiki. Your highs FAR outweigh the lows and it all looks so…….. what’s the word I am searching for…..DELICIOUS! The pork, apple and black pudding pie sounds amazing! It’s a great recipe. I’ll post it up soon, promise!